1. No entry fee and no purchase necessary. 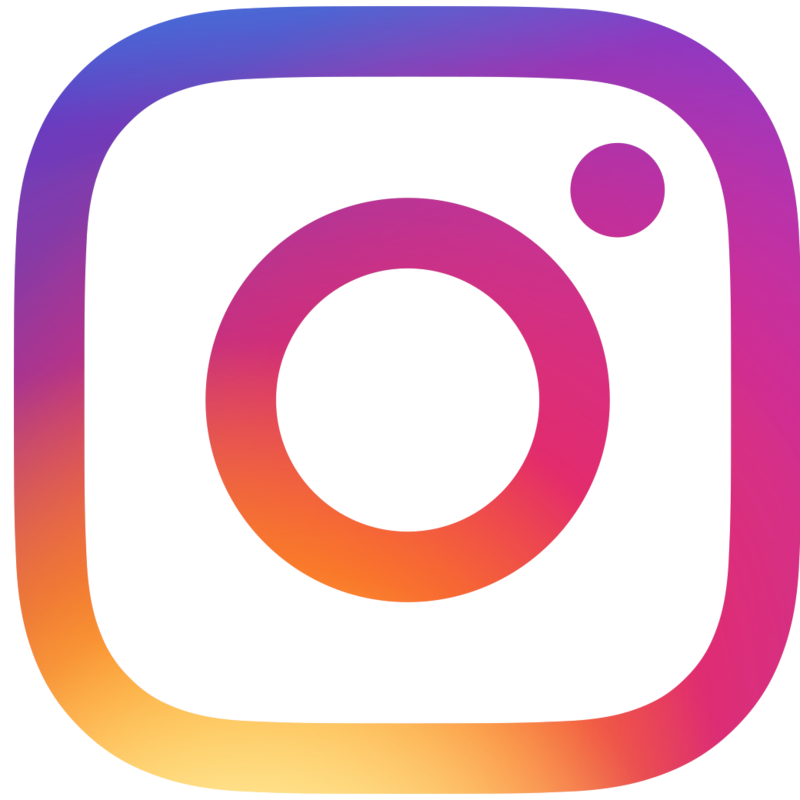 The contest begins on October 1, 2018 and ends February 15, 2019. To enter the contest, you must sign an official release, waiver and declaration form when you bring in a deer that you have harvested according to these rules for scoring. The contest may be entered by any legal hunter whose harvest was killed within the counties listed in rule 9 by legal means subject to the following rules and conditions. 3. Hunter must have valid Mississippi hunting license. 4. Deer may be delivered fresh or frozen (skinned for mount) to Turner Bros. Taxidermy, 315 E. Pine St., Hattiesburg, MS 39401 or a designated drop-off station. 5. All deer must have been taken in accordance with game laws. 6. No road or night kills. 7. All taxidermy work by Turner Bros. Taxidermy, Hattiesburg, MS.
8. Gross Boone & Crocket scoring system. 9. Deer must have been taken in the following Mississippi counties: Covington, Forrest, Jasper, Jones, Lamar, Marion, Perry and Wayne. 10. Only native Mississippi white tail deer eligible to enter contest from specified counties. 11. No deer preserved inside high fence areas are eligible. 12. Any or all winners subject to polygraph tests. If winners are unable to perform polygraph test, entry could be forfeited. 13. Winners of prizes are responsible for any and all applicable taxes. 14. Deer of 1st place winners in Open and Youth Divisions will be mounted at the close of the contest. All other deer are mounted in the order they came in, provided deposit has been paid. 15. All deer antlers & capes must remain at Turner Bros. Taxidermy once entered in contest until after the awards ceremony (TBA). 16. If hunter does not intend on having Turner Bros. Taxidermy mount his or her deer, do not bring deer in for scoring until the last day deer are received for contest (Feb 16th, 2019) to avoid caping and storage fees. 17. All deer to be scored must be in the hands of Turner Bros. Taxidermy no later than February 16th, 2019. 18. Top 5 winners in the Open Division and Top 5 in the Youth Division must be present or have qualified relative present at awards presentation (TBA). All winners are encouraged to attend. 19. Fifteen years old is the cut-off for Youth Division eligibility. 20. Youth winners may be asked to provide birth certificate. 21. If your deer placed in contest, you will be contacted on or before Feb 18th, 2019. 22. 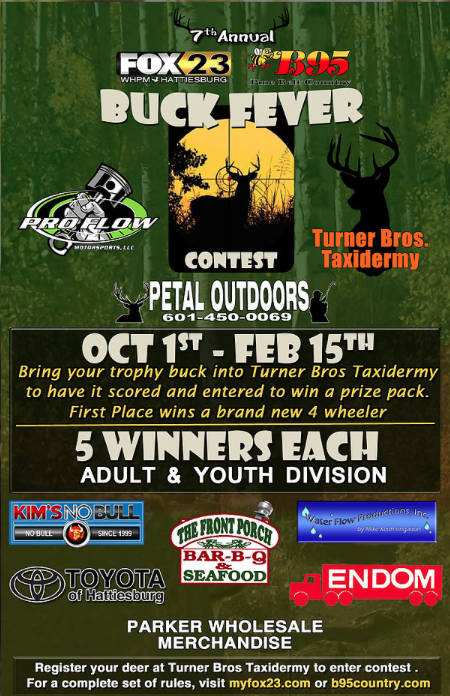 Additional contest rule information available from Turner Bros. Taxidermy. 23. All prizes must be picked up no later than April 8th, 2019 or will be forfeited. No exceptions. 24. All scoring final. No protests allowed. 25. In the event a prize should become unavailable, WHPM-TV and B95 have the right to substitute the prize with something similar and equal in value. All awarded prizes are final and non-negotiable or transferrable. 26. All entries picked up unmounted after February 18, 2019 will be charged a skinning, scoring & storage fee. 27. Promoters of this contest reserve the right to change or modify rules at any time by posting changes at Turner Bros. Taxidermy and/or online. 28. Prizes will be awarded to the top 5 places in the “Open Adult” division and “Open Youth Division”. 29. Open Adult Division – any legal deer harvested by rifle, shotgun, pistol, black powder or archery weapon by contestant 16 years or older with valid Mississippi hunting license. Open Youth Division – any legal deer harvested with rifle, shotgun, pistol, black powder or archery weapon by contestant 15 years or younger. 30. By entering a deer that you have harvested in this contest, you give WHPM-TV, B95, all participating sponsors or any other media or promoters the right to use your name, picture, etc. on television, radio, internet or print, as part of the promotion of the Buck Fever Contest. 31. By entering this contest, each entrant and winner, if 18 years of age or older, acknowledges and agrees that he/she is primarily responsible for his/her safety. The parent/guardian of a participant under 18 years of age acknowledges and agrees that the parent/guardian is primarily responsible for the participant’s safety. 32. All entrants and winners agree that in consideration for WHPM-TV and B95 allowing the participant to enter this contest, participant (and the parent/guardian of a participant under 18 years of age for and on behalf of the participant and the parent/guardian) assumes all risk of such participation and agree to release WHPM-TV, B95 and all participating sponsors, and (except as expressly provided below) all of WHPM-TV, B95 and all participating sponsor’s directors, officers, employees, volunteers, and agents from any and all claims for any injury of any kind to the participant (and the parent/guardian) or other damages that may occur as a result of the participant’s participation in the contest, including without limitation any injuries or other damages that may be caused by the negligence of WHPM-TV, B95 and all participating sponsors or negligence of any of WHPM-TV, B95 and all participating sponsor’s directors, officers, employees, volunteers, or agents and agrees not to file any lawsuit or otherwise make any claim against WHPM-TV, B95 and all participating sponsors or any of WHPM-TV, B95 and all participating sponsor’s directors, officers, employees, volunteers, or agents for any such injury or other damages. The participant (and the parent/guardian of a participant under 18 years of age) does not agree to release any claims against any individual person who intentionally causes injury to the participant.